All adults are invited - age 16 and up. Materials will be provided. 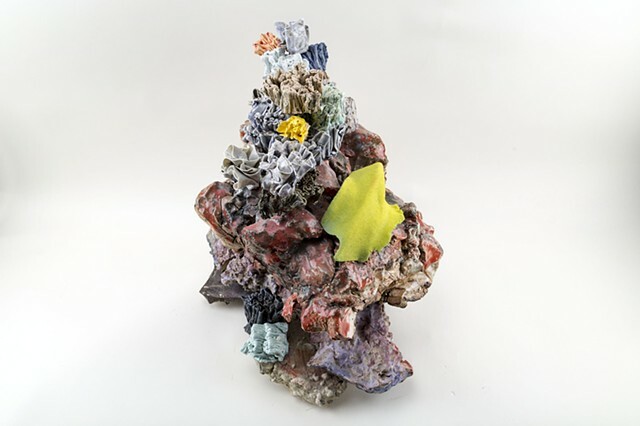 Thanks to the New York State Council for Arts, and the Huntington Arts Council, this summer ceramic artist Lauren Skelly Bailey will be featured at the Great Neck Library as part of her Creative Communities Grant project. In her statement Lauren describes her work as exploring methods of making assemblage sculptures, conglomerations, installations, and figurines. "I consider myself as an explorer, seeking new ways of layering, swirling, forcing, bending, breaking and reusing surfaces." A conversation between elements of nature emerges from her practice. " Flora, fauna, rocks, and the tooled objects made by man are called to mind. In combining them, I forge a new perspective of these elements." Lauren’s project entitled, “Coral Awareness,” will take shape in two parts. The first is a gallery exhibition featuring new sculptures created from research on the effects global warming has had on corals. In this research Lauren found that corals emit their own algae tissues resulting in the coral turning completely white. From this research Lauren will be creating three installations focusing on the metamorphosis of healthy corals to bleached corals. The second portion of Lauren’s grant project will involve the public; she will be hosting two workshops at the library for adults 16+. Each workshop will supply all materials for the duration of the workshop. The first workshop (6/26 12-2pm) attendees will hand painting ceramic tiles with coral inspired imagery and learn about the effects of global warming on corals. The second workshop (6/28 12-2pm) will involve, hand-painting patterns on hand pressed clay, sweeping up the clay into ribbons, and manipulating these ribbons into coral sculptures. Both workshops involve some firing off site at Lauren’s ceramic studio and the works will be displayed in the library gallery for viewing post firing. Please make sure to register for these limited engagements prior to the workshop to ensure there are enough materials for each attendee. Everything created in these workshops will be on display in the cases at the Library during the month of August. Registration Required and is Limited. Call 466-8055, ext. 208 or register online beginning March 26. There is also a workshop on June 28. Come to one or both! For more information on Lauren Skelly Bailey’s studio practice and work, please visit www.laurenskellybailey.com. 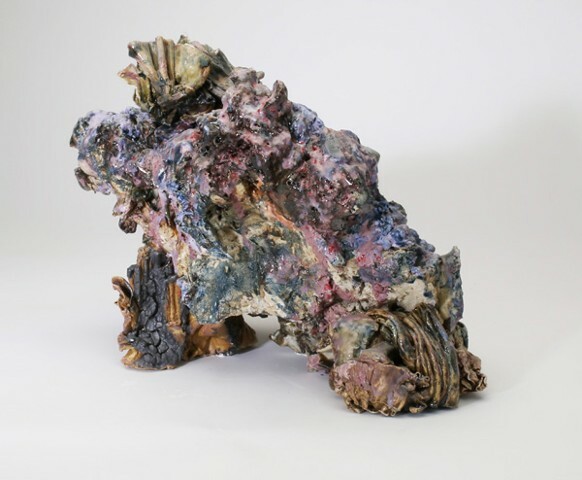 Corals, is an art exhibition featuring the ceramic works of Lauren Skelly Bailey. 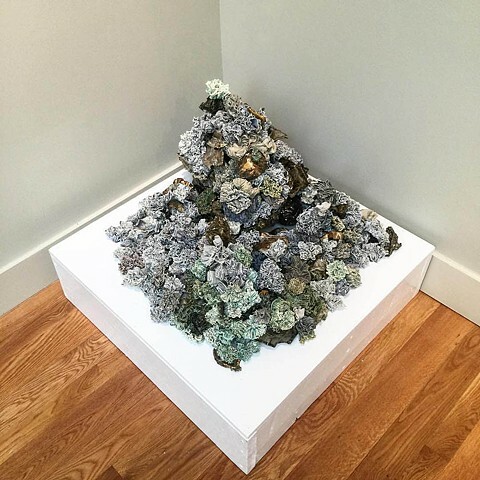 Lauren’s work explores methods of making assemblage sculptures, conglomerations, installations, and figurines revolving around the cyclical life of corals. This exhibition will survey new works created to bring awareness of coral bleaching events. Through recent research Lauren has found evidence that pre bleaching events, corals change their color pre bleaching, from vibrant colors to bright neon colors lime, light blue and pink. Their need to change color has to do with protecting themselve from the sun's UV rays warming the ocean, and the temperature rising. This color change allows corals to protect themselves similar to applying sunscreen. Through Building Corals Workshop on March 24th 2018, families will have the opportunity to use air-dry clay to create neon colored coral sculptures similar to those being currently found pre bleaching events. To sign up please contact the EMPL at 516-794-2570. October 22nd from 12 to 4pm, I will be having a Pop Up Shop event at West Elm, in Wayland Square. The work brought with me can be previewed on Instagram @laurenskellybailey. In my recent studio practice, my work has taken me outside the studio and on to Route 106 to install/display work up for grabs. Over the course of the new few weeks, pieces will be documented via Instagram with locations for pick up. Anyone is welcome to take a piece, or whole work home with them in exchange for a picture of them with the work or in their home. This project started during my residency at the Museum of Arts and Design, when I started planting work on the LIRR, in subways, on subways, and even on the sidewalks of the city. Every piece had a note about why, and what to do. Not everyone has access to Instagram, so other forms of contact where also left for the finder to use. Yesterday work was located at a high school, on a metal beam off Route 106, on a bench, near a pole and a few other spots. If you are interested in following along please feel free to follow on Instagram @laurenskellybailey. Later this week Route 106 from East Meadow down to the south shore will be next! 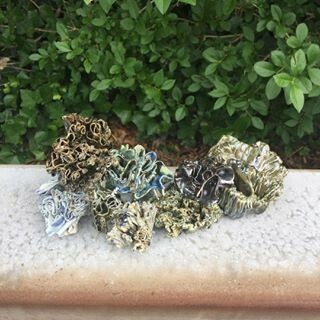 Happy hunting, and if you do find a floral coral do me a solid -- post on IG with hashtag #lsbcoral. 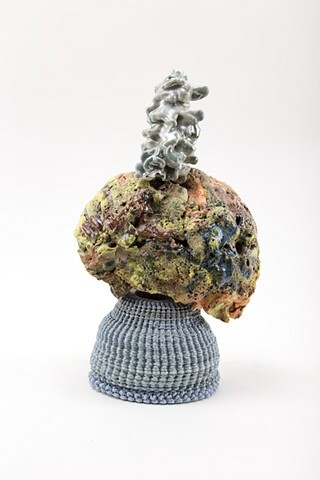 My sculpture Coral Stack and installation Constructing Awkward Beauty will be feaured in the Ceramic Innovations exhibition at the Wayne Art Center, Wayne, PA, April 1st- 29th. Ceramic Innovations is an international juried exhibition highlighting contemporary ceramics of emerging and established artists. The work ranges in functional forms, sculptures, and installations. Juror – Chris Gustin, Founding Member of the Watershed Center for the Ceramic Arts, Newcastle, ME and Owner, Gustin Ceramics Tile Production. Gustin earned his BFA in ceramics in 1975 from Kansas City Art Institute and then his MFA in 1977 from New York State College of Ceramics at Alfred University. His 20-year teaching career included terms at Parson’s School of Design, Boston University and the Swain School of Design (later Southeastern Massachusetts University, now University of Massachusetts, Dartmouth), where he headed the ceramics program. 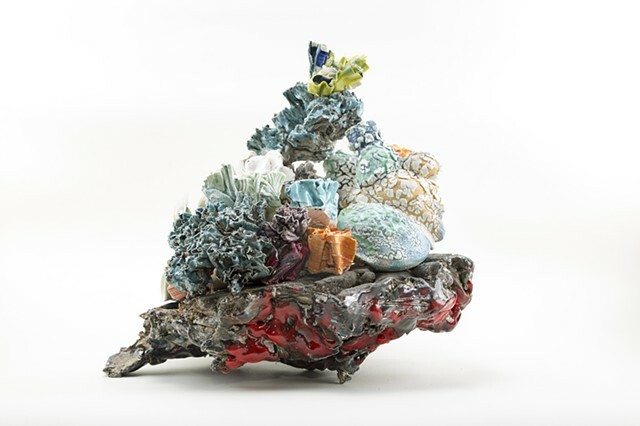 Along with other ceramicists, Gustin founded the Watershed Center for the Ceramic Arts in 1986, which continues to offer residencies to artists from around the world. He now runs Gustin Ceramics Tile Production and produces large-scale sculptural and studio ceramics. Happy to share news that for the next few months, on Thursdays I will be working at the Museum of Arts & Design, as a resident artist from 10-5pm. My project is to document found textures and architectural elements in the city and to find ways to implement them into my ceramics installations and objects. Ruth & Harold Chenven Foundation awards grants to artists to continue their explorations, each year they pick several artists based on portfolio, artist statement and work proposal. This year I'm honored to say that I've been choosen to receive a cash grant to help purchase an air compressor to continue my explorations and studies in 3D printing parts for my geological sculptures and installations.